Use an asterisk (*) for partial searches. An improperly maintained cooling system can result in costly repairs and downtime. Luber-finer® coolant filters and system solutions help protect your investment. Luber-finer® coolant system products can help reduce fleet costs, downtime and prolong the life of your equipment. Luber-finer® Heavy Duty Cooling System Products help protect your system against corrosion, build-up of harmful deposits and help balance the pH of your coolant. 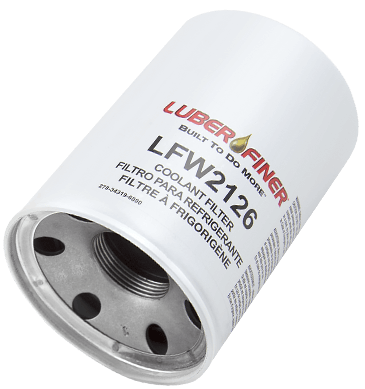 Luber-finer® Controlled Release Technology (CRT) SCA Coolant Filters protect fleet cooling systems up to one year, 150,000 miles or 4,000 hours. Luber-finer® recommends changing Extended Service Non-SCA coolant filters every year, 150,000 miles or 4,000 hours. Be sure to service your cooling system according to the coolant manufacturer’s recommendations for testing and treatment. When using non-ELC, test and treat with Lubercool II SCA to protect your engine from harmful corrosion, cavitation and scale.